Solar water heaters have developed in the past 100 years into a mature technology to provide reliable hot water while reducing our global carbon footprint. 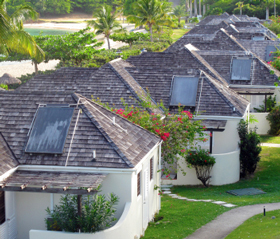 In some countries, solar water heating on rooftops is as common as antennas. These systems are efficient and economical and are used throughout the world, especially in the Mediterranean and Asian-Pacific regions, to cut down energy bills. But there are some things you need to know before you go out and purchase a solar water heating system, because solar water heaters are a little more complicated than your run of the mill gas or electric water heater. A solar water heating system generally consists of the following components: solar thermal collectors, a water storage tank, a circulation system with a circulator pump and a temperature controller, and a back-up gas or electric booster. In an indirect solar water heater system, an extra heat exchanger is needed, as well as an additional drainback reservoir. In this learning article, we are going to explore the operation of solar water heating systems and walk you through the complicated and sometimes confusing classifications of these systems. Before looking at different kinds of water heaters, let's first go over how solar water heaters work. First of all, solar thermal collectors installed on your roof capture solar radiation and use it to heat a liquid inside the absorber. This process is entirely different from solar photovoltaic (PV) panels that generate electricity that you use in your home. Solar panels transform energy into electricity. Solar water heaters transfer energy. We know that this may be confusing, but we refer to the solar modules that generate electricity as solar panels or solar modules. Solar collectors in a solar water heater system may look somewhat similar, but they are entirely different. The circulation system then moves the heated liquid from the solar collectors to where it is required. There a heat exchanger safely and efficiently transfers the thermal energy from the heated fluid in the solar collector to domestic water in the insulated storage tank. This storage tank keeps the water warm. An indoor drainback reservoir is used to store the heat-transfer liquid when the circulator pump stops, preventing the liquid from overheating in the summer and freezing in winter. If it is overcast a back-up gas or electric booster can help heat the water. Solar water heating systems can be classified in many ways. One basic way to differentiate solar heaters is based on what is heated in their solar collectors. This yields two distinct categories: direct and indirect systems. Direct solar water heating systems, also called open loop systems, circulate household water, which we use to shower and wash our hands, from the water tank to the collectors and back. On the other hand, indirect or closed loop solar water heaters use a heat exchanger to separate your water from a heat-transfer fluid, usually antifreeze that circulates in the collectors and piping system. Though more expensive and maintenance heavy, indirect systems operate reliably in very cold or hot conditions. The heat-transfer fluid prevents both freezing and overheating. 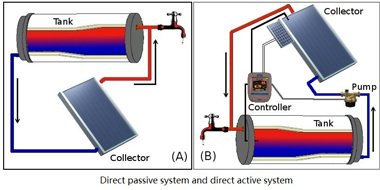 Based on whether external force is used in the circulation system, solar water heater can be categorized into active and passive systems. Active solar water heating systems employ pumps to circulate household water or anti-freeze through the system. They also regulate the overall process using electronic controllers, Direct passive and active solar water heating systemsamong which the temperature controller is the key component. The temperature controller monitors the temperature difference between liquid leaving the solar collector and water in the storage tank. Typically the controller turns the pump on when the liquid (domestic water or antifreeze) in the collector is about 5-8 degrees Celsius warmer than the water in the tank, and turns the pump off when the temperature difference approaches 3-4 Celsius. This control process prevents the pump from cycling too often and water in the tank from overheating. You may think that we've already looked at a lot of solar water heating types and that direct passive, direct active, indirect passive and indirect active systems accurately describe all of your choices. However, there are still some subcategories to explore. Passive direct solar water heating systems can be broken up into two types based on where the water is stored. 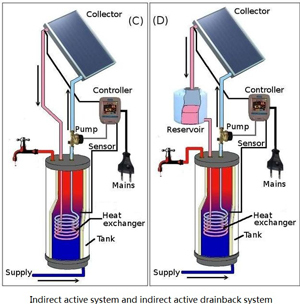 Integral collector-storage systems (ICS) combine the solar collector and storage tank. The integrated tanks are housed in an insulated glazed box that faces the sun, absorbing solar radiation and thus heating your water. Since the water is stored outdoors, this system is only suitable for warmer climates where there is little heat loss overnight. Thermosyphon systems, on the other hand, do not store water in the collector. They circulate the water without pumps to an either indoor or outdoor storage tank that has been installed above the collectors. Water naturally flows through the system: warmer water rises to the tank and cooler water falls to the collectors for heating. 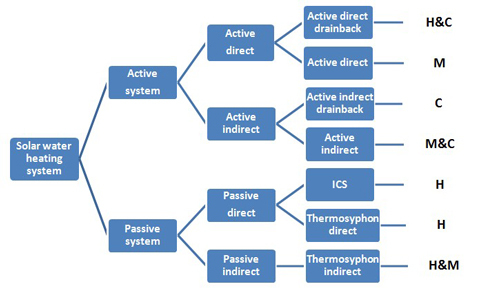 Thermosyphon systems are more expensive than ICS systems , about but operate better in colder climate. Generally a passive indirect solar water heater is a thermosyphon system that uses antifreeze. In active indirect solar water heating systems, a drainback reservoir can be added to improve performance. In these systems, the collector piping is not pressurized and includes an open drainback reservoir that is contained in a conditioned or semi-conditioned space. If it becomes too hot in the collector, the pump is switched off and the antifreeze fluid drains into the drainback reservoir. For this to occur without added pressure, all piping above the drainback tank, including the collectors, must slope downward. When the temperature difference reaches a normal level, a pump circulates the heat-transfer liquid back into the Active solar water heating systemscollector. Therefore the active drainback system prevents heat related damage to the collector or the antifreeze liquid while also ensuring that your water does not overheat. In active direct solar water heaters, the drainback system avoids a lot of heat loss at night because the water drains back into the indoor tank. Moreover drainback systems require no maintenance. Unfortunately, due to their many advantages, active drainback systems are the most expensive solar water heating systems. If you are a little bit overwhelmed by all the information above? In this section we will give a simple and concise guide to choosing a solar water heating system. If there are many people living in your household and you are located in a warm climate, a direct active solar water heater system is probably your best option considering overall cost and efficiency. If your home water consumption is higher during the morning hours because of shower use and cooking but tapers off after the kids go to school and you are in the office, you should choose an active solar water heater with a drainback system to make sure that your water is kept warm at night. If you have hot weather all year round and don't want to spend time and money on maintenance, a passive direct system makes the most sense. If you live in an area with moderate climate and don't have a large budget, you can choose a thermosyphon system if you can mount a storage tank above the solar collectors. If you live in a cold area, an indirect system is a logical choice because the heat-transfer liquid, usually antifreeze, will allow operation over a wider range of temperatures. You can check your local weather at U.S Department of Agriculture Research Service when you are choosing a solar water heater. The chart below gives you an insight into what kind of weather each of the seven solar water heater categories is best suited for. "H" means hot, "C" means cold, and "M" means moderate. After reading this article, you should have a much better idea of how to choose your solar water heating system. If you are like most, you will choose among the most popular solar water heating systems, which are the active indirect, active direct drainback, and thermosyphon systems.